The Pilot Plant is established at INOXPA headoffice in Banyoles as a result of both external and internal demand. It meets the internal demand for a testing facility for new equipment designed by the R+D team in order to obtain verified results in terms of performance and possible applications. 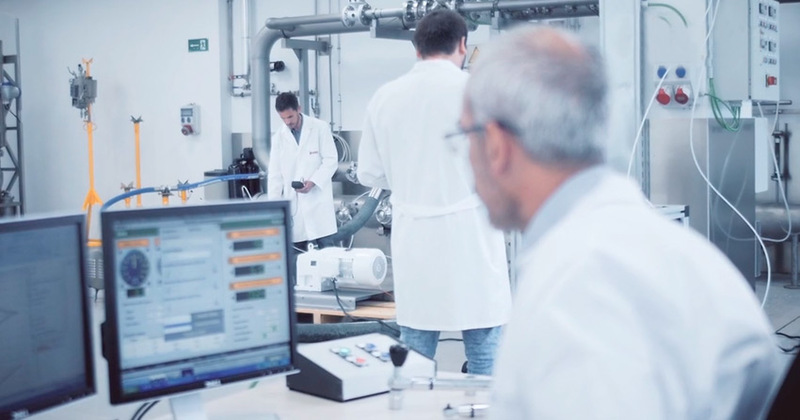 It also offers our customers an opportunity to test a wide range of INOXPA equipment with real products and obtain outcomes that can be extrapolated to industrial production. This software is designed for users of all levels. It is provided with all the performance curves of the centrifugal and side channel pumps. The head and flow rates of the design point required by the user generate a list of pumps that comply with the specifications indicated, the pumps are ordered according to the size, efficiency, NPSH or power in order to facilitate the comparison. By choosing to use original INOXPA parts, you will be guaranteed maximum performance, protection of your equipment and its operational reliability, and a minimum downtime. The original spare parts are of the highest quality, factory calibrated and tested in production lines around the world. INOXPA's firm commitment to continuous improvement is what enables the company to meet the highest of market standards. All of the spare parts are supplied in INOXPA branded packaging. The extensive commercial network provides continuous support and availability of parts. The INOXPA experts are at your disposal for any advice you may require. All of INOXPA's customers are offered support and advice before, during and after the sale. The services that INOXPA offers are designed to assist the customer in, firstly, selecting the product that best suits their needs and, secondly, in using the product correctly: planning, installation, training, troubleshooting, maintenance and repair, renovation and modernisation. Thanks to the Group's extensive commercial network, INOXPA can guarantee a fast and reliable service for customers around the world. Click here to find your nearest support centre or send us a message. INOXPA is a company that gives vital importance to offering its customers the most reliable guarantees. For this reason, the company’s goal has always been to achieve as many certifications for their products as possible.